I have been regularly encountering an issue with a USB keyboard and mouse, where the mouse pointer freezes, and the keyboard experiences missed or delayed keystrokes. After approximately two seconds, it would unfreeze again, but the problem would reoccur almost immediately. Having now found a solution, I thought I would share it in case anyone else is experiencing the same issue. 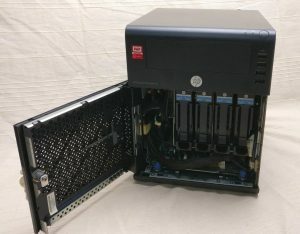 In a previous post I detailed how I built a NAS server from a SuperMicro X8DTL-3F motherboard with Xeon E5645 CPU and DDR3 ECC Registered memory. It set me thinking on my spare PC. This PC used to be my main PC before an upgrade and is not really appropriate for what it is used for. It has an Intel Core i7-3770K 4-core (8 thread) CPU and 32GB DDR3-1866 memory. Since I use it mostly for builds, far more cores would make for a PC far better suited for what I use it for so I decided to build another server system, but this time configured as a workstation. I’ve been running a small NAS server for several years using the excellent HP MicroServer N40L upgraded to 8GB RAM (officially its max, although I know some people have got it to work with 16GB), and with five WD Red 2TB drives, running FreeNAS v9. The N40L only has 4 warm swap bays, or “Non-Hot Plug” as HP calls them, but also has a 5¼” optical bay into which I had put a 3½” bay adaptor tray to run a 5th drive. I had it configured as a 5x2TB RAID-Z array giving 8TB of filestore. However, with FreeNAS now needing a minimum of 8GB RAM, and the 5th bay dragging the speed of the SATA ports down to 1.5 GB/s, I felt I had outgrown it.